Offices, and the way we work in them, are changing for good. Lighting has to change too. Offices, and the way we work in them, are changing for good. Lighting has to change too. From flexible working to personalised control, the need to save energy, and putting people at the heart of lighting design, the prioirities and practices of office lighting are in flux. Here's what you need to know. devices, and may not be at the same desk from day to day. Laptops, tablets and phones with backlit screens are everywhere in the modern office, so glare that could make these difficult to use must be avoided. Saving energy is one of the key ways lighting can add value for owners and operators of ofices. By spending a little more upfront, users can make big savings in the long run. The good news is, it’s easier than ever to save energy in offices with lighting. 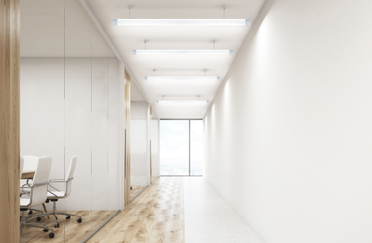 Most offices have been using energy-efficient T5 fluorescent lighting for years, so LED lighting has been slower to catch on in offices than in some other applications. control systems are wireless, making it easy for staff to control them from mobile devices or handheld controllers, and making installation and commissioning much simpler, because no new wiring is required. Offices are increasingly seeking to maximise the amount of natural light they benefit from. People like having access to daylight in offices, and it has been shown to be good for us. It’s also free. This presents an opportunity to get energy costs down by dimming lights or turning them off when there is sufficient natural light available. To achieve it, you’ll need good controls.